If you love being virtual — but not all of the time — then a VA Connection is for you. A VAC (Virtual Assistant Connection) is an opportunity to meet face-to-face with other VAs in your area. Veteran, new, emerging and those considering a career in virtual assistance meet to break bread and discuss the virtual assistant life. IVAA members host these events, which usually occur quarterly. Working remotely has great benefits, but it can be a bit lonely at times. The annual summit is the perfect opportunity to connect with peers, but what do you do the rest of the year? Go to a VAC, of course! You will meet VAs in your area and build a network of friends who share your passion. Many have “been there – done that.” — and here’s the best part — they’re willing to share their knowledge because they know they will learn something new as well. *There is no charge to attend other than the cost of your own meal or beverage. Is there a VAC in your future? 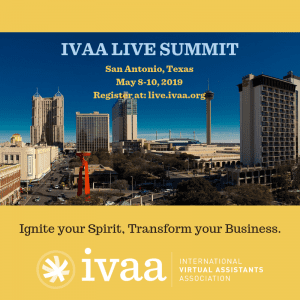 Keep an eye on the IVAA calendar as all upcoming events will be posted there along with contact information so you can start making connections. If there’s no VAC in your area, then why not volunteer to host one? It’s easy and IVAA will help. We’ll post your event, help with press releases and encourage you at every step. Remember, it only takes two to make a connection. If you are an IVAA member and interested in coordinating a luncheon in your area, please complete and submit the below form. *Disclosure: IVAA does not charge its members or non-members for any participation in Local VA Connection Groups. However, individual groups may possibly charge their members, their fees are not affiliated with IVAA. Is your group currently meeting?